THE NATIONAL WEATHER SERVICE confirms what many Minnesotans had already figured out. Several tornadoes touched down during a massive storm system that began near the South Dakota/Minnesota border late Friday afternoon, July 1, and swept as far east as northwestern Wisconsin. In my home area of Redwood County, two tornadoes were confirmed—both in the northwestern section of the county. According to the NWS Chanhassen office, an EF-1 tornado with maximum winds of 95 – 105 mph began approximately six miles west of Vesta and continued for some 21 miles to the northeast. 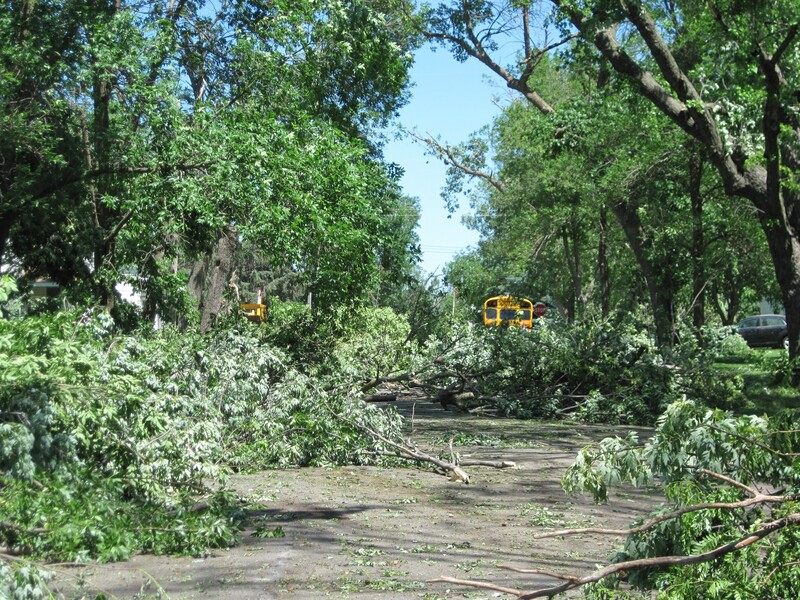 The maximum half-mile wide twister moved across Belview, which saw the most widespread tree damage in the surveyed area. The tornado then crossed the Minnesota River and ended two miles into eastern Renville County. Click here to read my previous post on the storm damage in Belview. Trees blocked the street north of the Belview City Park following the tornado that passed through this Redwood County community of 375. Photo courtesy of Merlin and Iylene Kletscher. The second EF-1 Redwood County tornado just nipped the northwestern corner of the county traveling a 2 ½-mile path. The tornado hit the farm of my cousin, Marilyn Schmidt, and her husband, Dan. To see the damage there, click on this post published yesterday on Minnesota Prairie Roots. This tractor rigged with chains holds up a wall of a shop on Dan and Marilyn Schmidt's Wood Lake area farm. The building was severely damaged by Friday's twister. I'm showing this photo specifically for the reader who yesterday questioned how a tractor could hold up a wall. Photo courtesy of Heather Rokeh. Three other tornadoes were confirmed in southwestern Minnesota—the most-damaging an EF-2 in Tyler with winds estimated at 115 mph. Check out the storm assessment of this 3-mile long tornado in Lincoln County near the South Dakota border by clicking here onto the NWS Sioux Falls website. You’ll also find information there on an EF-1 twister that struck the Ruthton area in Pipestone County with wind speeds of 100 – 110 mph. Strong winds, not a tornado, apparently caused the damage in my hometown of Vesta. The Chanhassen office of the NWS lists the storm there as “a series of downbursts” with wind speeds of 90 – 100 mph. 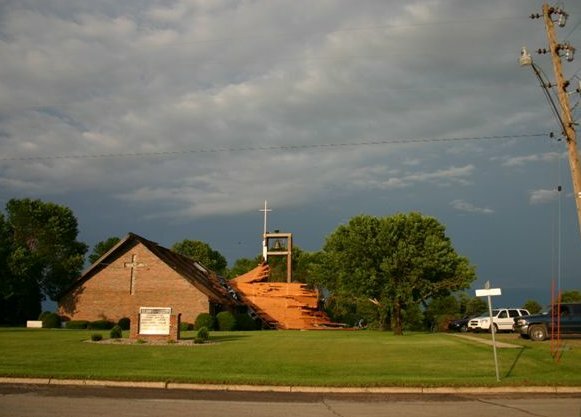 Destruction in Vesta included dozens of downed trees, a roof partially-lifted from St. John’s Lutheran Church (my home church), smashed grain bins, damage to the elevator and more. To learn more about the damage in Vesta, read my previous blog post by clicking here or click here to read a story published in The Redwood Gazette. St. John's Evangelical Lutheran Church in Vesta with the roof half ripped off by strong winds during the Friday afternoon storm. Photo courtesy of Brian Kletscher. The NWS also determined that an EF-1 tornado with wind speeds of 100 – 110 mph cut a 300-yard-wide, 2 1/2 –mile swath northeast of Danube, lifting much of the roof from at least one home. Check out the two NWS websites for maps, photos and more detailed information on the storms and the resulting damage. Also visit the Belview Blue Jays Facebook page, where you’ll find photos of storm damage and other information from Belview. IF YOU HAVE INFORMATION and photos you would like to share of storm damage, please submit a comment and I will follow-up with an email to you. Based on my blog readership yesterday and Tuesday, interest in the southwestern Minnesota storms remains high. Yesterday Minnesota Prairie Roots blog views totaled 1,129, my highest daily total since launching this blog. On an average day, I get around 400 views. Well how nice of them to confirm them. What if they had not confirmed them? Would everything magically go back to the way it was? I’m not trying to be snarky, just curious. This is standard procedure for the NWS to go out, survey the storm area and determine whether damage was caused by winds, a tornado or some other weather event. Because of the widespread area this storm system covered, officials could not possibly survey the entire region and that is noted in their report. People always like that official confirmation. I expect the loss of trees is especially difficult for many who live in southwestern Minnesota. 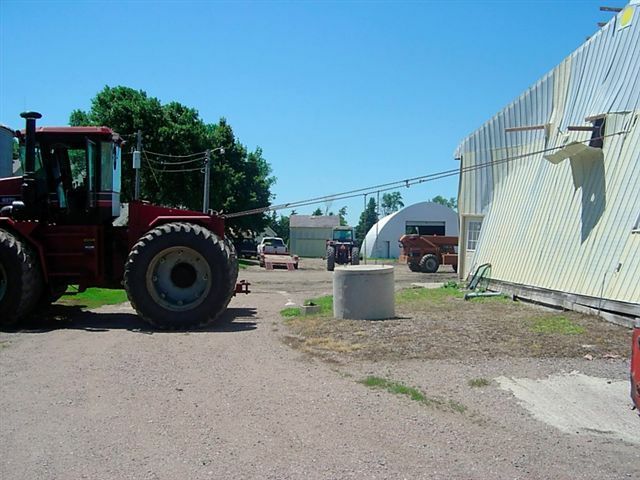 The land is mostly open with trees planted mostly in the small towns and then around rural farm sites as windbreaks. Hi Audrey, My name is Paul Oster. I am working on a video for Farm Rescue (www.farmrescue.org). We were recently in the area of Renville, MN assisting a farmer (Kurt Kramin) with injuries caused by burning debris after this storm passed through the area. I would like to get permission to use the 1st and third photo on this page. Paul, I can work on securing permission for you to use those photos. Since I did not take the images, I will need to contact the individuals who did. I googled Farm Rescue and applaud an organization like this which helps farmers in need. I will e-mail you directly so we can communicate directly rather than through the comment section here.